Remember, the Expedition EL is among the largest vehicles on the planet. It's a wise choice for lots of drivers--and not at all a good choice for many more who really need to park, garage, and drive something a bit smaller. The 2015 Ford Expedition isn't totally new, but the much-needed refresh gives it heady twin-turbo power and a slick-riding adaptive suspension. The biggest SUVs on the planet have resisted extinction--but it doesn't mean they've gone without meaningful change. 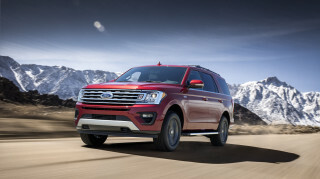 Just when it almost looked like Ford had written off its full-size truck-based SUV completely, the Expedition has been brought fully up to the expectations of a new decade of SUV shoppers with a higher-mileage turbo V-6. a new continuous-damping suspension system for more comfort and quiet, and cosmetic improvements all around. Looking at the Expedition’s toughest rivals, it’s rising to the challenge just in the nick of time—now that full-size GM SUVs (the Chevrolet Tahoe and Silverado, and the GMC Yukon and Yukon XL), have been given quieter, more stylish interiors, more features, and a fuel-saving engine lineup. 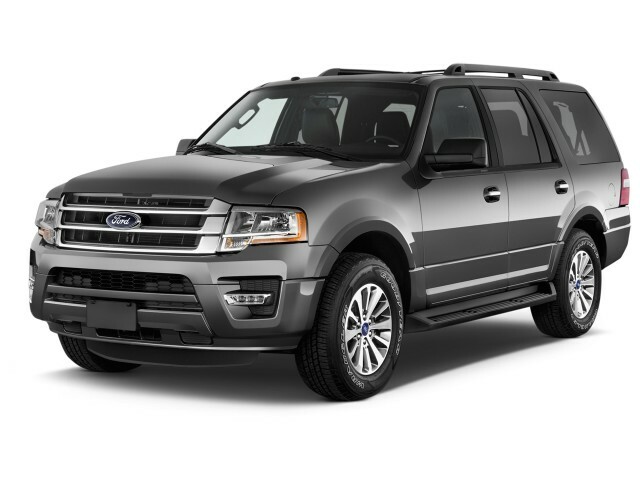 The 2015 Ford Expedition no longer shares a frame with the Ford F-150, now that the F-150 has gone in a radical new direction, with lightweight aluminum construction. So while the F-150 has become flatter, more planar, and angular, the Expedition still has a softer and more streamlined look—one that's essentially been intact since 2007. The new model year brings only a thick new chrome strip across the back, an updated grille, wheels up to 22 inches, and plush new interior trim, as well as a more distinctive Platinum model. Inside, the biggest news is the MyFord Touch infotainment system, with its eight-inch screen; two new, smaller full-color 4.2-inch screens flanking the steering wheel; and a clean new center-stack design to accommodate it. The big news, however, is that Ford is forgetting about the V-8 and instead installing its EcoBoost V-6. The power's not explosive, but the Expedition is now a truly quick vehicle, despite its mass and height. The 365-horsepower turbo six even makes good, growly noises, while maintaining the SUV's strong 9,200-pound tow rating. It helps Ford in the EPA derby too: the new SUV is rated as high as 16/22 mpg (up from 14/20 mpg with 2WD). Powertrain is only part of it, though. Ford has also added a continuously damping system to the Expedition—for the first time ever on a Ford-brand vehicle. In the 2015 Expedition it offers three modes—comfort, normal, and sport—and along with new electric power steering, only boosts the Expedition's reputation as a brute ute that rides and handles better than most of its rivals. It's a shame the new adaptive shocks only are offered on the most expensive versions, in a $2,180 package. The two lengths of the Expedition—standard and EL—carry over for 2015. With the Expedition EL you gain 14.8 inches longer overall, with longer rear fenders and glass. It's one of the biggest SUVs on the planet, frankly, and its wheelbase of 131 inches is longer than the full length of either a Smart fortwo or Mitsubishi i-MiEV. With either version you get an almost van-like interior and loads of passenger space in the first two rows, but cargo space is more abundant and third-row access is much easier in the EL. Just beware that you’ll pay the price in maneuverability and parking ease. The Expedition has earned excellent crash-test scores from the NHTSA, while the IIHS hasn't yet tested it. A rearview camera is now standard, and blind-spot monitors are available. Four trim levels are available: XLT, Limited, King Ranch, and Platinum. Expeditions come with at least the expected power features, Bluetooth, the rearview camera, and USB ports, with a starting price of about $44,000. Platinum models start as high as $61,000 and can be fitted with a wine-color Brunello leather with tuxedo stripes and French seams; seven-color LED ambient lighting; Ford truck apps for towing; and a ten-speaker, 700-watt Sony sound system. For those still seeking out truck-like SUVs that look the part, the Expedition still fits the bill. The 2015 Ford Expedition no longer shares a frame with the F-150, now that the full-size pickup has switched to an aluminum body. The Expedition soldiers on, for now, with a lightly retouched look on the existing steel body--a good-looking one, albeit one that's nearly a decade old now. Visually, the new Expedition has a somewhat chunkier yet softer and streamlined look—within the confines of its carry-over profile. There’s a thick new chrome strip across the back that, from pictures, looks to visually lower this big ute, while wheel sizes now range up to 22 inches and exhaust pipes are now chrome-tipped. Inside, plush new upholsteries have been added, and the Platinum model’s trim has been upgraded for more contrast. And yes, there is indeed a plush King Ranch model on the way. From a design and functionality standpoint, the biggest news is front and center, where the MyFord Touch infotainment system has been installed here, with an eight-inch screen, two new, smaller full-color 4.2-inch screens flanking the steering wheel, and clean new center-stack design to accommodate it (and fit in with current Ford models). It's a more cohesive look than the Expedition's former cabin had, with its layers of woodgrain and metallic trim, and it imparts a more convincing look of quality. New twin-turbo power puts the Expedition's output on par with its surprisingly capable handling. The Expedition has been cured of its formerly sluggish feel, and its strong towing abilities and surprisingly crisp handling give it a direct driving feel you probably won't expect from a vehicle of its size. Big change comes under the hood this year, where Ford's finally moved beyond its Triton V-8s and installed its latest twin-turbo V-6. The 3.5-liter engine kicks out more power and torque than its predecessor and makes the Expedition truly quick--and appealing to listen to. The six generates 365 horsepower and 420 pound-feet of torque, and some of the car-nut magazines have registered 0-60 mph times at less than six seconds. Four-wheel drive remains available throughout the entire lineup, and the six-speed automatic transmission is responsive and smooth-shifting. And given the dramatic powertrain improvement, gas mileage hasn't suffered at all--it's actually higher on the EPA scale, at a lineup-best 16/22 mpg in the rear-drive Expedition. We've seen almost 18 mpg in mostly interstate driving, fully laden. 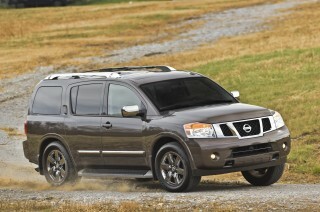 All that, and the Expedition also maintains its current towing ratings of up to 9,200 pounds. Considering the Expedition's mammoth proportions, driving it is quite easy thanks to light but precise steering--switched to electric actuation this year, and sharper and quicker than ever--as well as a suspension that does a good job in controlling all that weight. Yes, it's one of the biggest land yachts on the market, but it's manageable. We're still waiting on a test drive in an Expedition with the standard suspension setup. In past versions, the suspension did a splendid job of soaking up irregularities while keeping the back wheels glued to the road over rough surfaces, with none of the nervous hopping that characterizes solid-axle designs. But we haven't driven a 2015 that rides on conventional shocks yet. Instead we've spent all our time in an Expedition with a new set of adaptive shocks that filter off almost all of that, giving the Expedition a luxury-SUV ride. Of course, it's priced like one in this format too--the high-functioning shocks can only be fitted to Platinum models in a $2,180 package. You don't need a long-body Expedition to have cavernous, comfortable space and cargo room. The Ford Expedition is as big inside as it looks outside–it's truly cavernous, nearly rivaling the spaciousness of full-size passenger vans. The Expedition's front seats are captain's chairs, mounted high and affording a good view out, and a telescopic steering wheel and power-adjustable pedals allow for a vast range of body types (including smaller drivers). The expansive head and knee room continues in the second row of seats, and even adult passengers will find the third row spacious enough for short trips. Both a well-designed power liftgate and the PowerFold third-row seat make living with such a large vehicle—and making the most of it—easier than you might think, especially again for smaller moms. Ford's third-row seat is integrated more neatly than the same seat in GM's big utes, too. 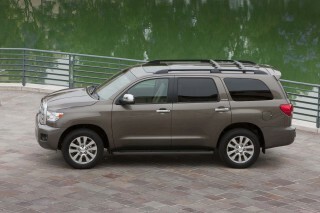 With the third-row seat raised, the standard Expedition has almost 20 cubic feet of cargo space available. Behind the front row of seats there's a maximum of 108.3 cubic feet--more than enough for any driver needing to upsize from a three-row crossover SUV like Ford's own Flex. 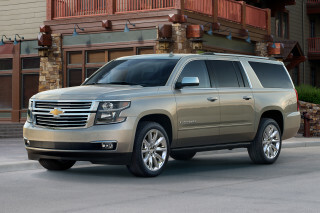 The NHTSA calls the Expedition a five-star act; the IIHS hasn't weighed in yet. Fresh off its most recent crash testing, the Ford Expedition proves that a relatively old body-on-frame design can still perform to the top levels. 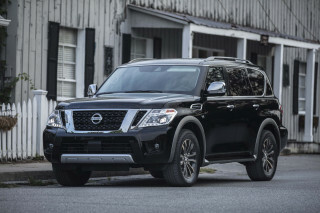 The National Highway Traffic Safety Administration (NHTSA) gives the Expedition a five-star overall rating, with five-star scores for most of its impact tests. In rollover resistance, the rear-drive models earn a low three stars, while four-wheel-drive versions earn four stars. 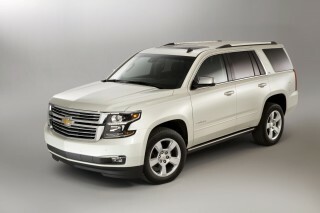 The Insurance Institute for Highway Safety (IIHS) has not yet tested the Expedition. The Expedition's safety gear remains top-notch. In addition to all the requisites, Ford fits the Expedition with standard side-impact airbags, a standard rearview camera. Blind-spot monitors are available, but adaptive cruise control isn't on the menu. In the past, we've kvetched about the Expedition's somewhat limited visibility. This year we've driven it just after a stint in GM's big new utes--and came away with a better perspective. 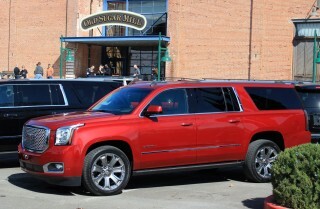 The Expedition's glass areas are much taller, giving a much less obstructed view to the sides and to the rear than the Escalade or the Yukon we've been in as of late. The Expedition's never been as costly, but in King Ranch and Platinum models, you'll believe it's worth every penny. Ford equips the Expedition well, and still, with a base price of more than $43,000, it's easy to crank one up to more than $60,000, even if it's not the top-line Expedition EL Platinum. The standard Expedition XLT comes with a good amount of standard gear. It includes power windows, locks, and mirrors; cloth seating; power-adjustable pedals; front and rear climate control; SYNC with Bluetooth audio streaming, a USB port, an auxiliary audio jack, and AppLink; satellite radio; rearview camera; rear parking sensors; cruise control; steering-wheel audio controls; flip-up tailgate glass; and 18-inch all-terrain tires. Major options include leather; power front and passenger driver seats; a power tailgate; power-folding third-row seats; and a towing package. The Expedition Limited gets perforated-leather front seats with heating and ventilation; MyFord Touch with an eight-inch touchscreen and voice commands, and two USB ports; automatic climate control; heated second-row outboard seats; power-folding third-row seat; woodgrain trim; remote start; pushbutton start; front parking sensors; and 20-inch wheels and tires. 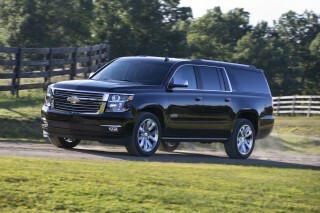 Options include a power sunroof; navigation with HD radio; and power-deploying running boards. The Expedition King Ranch gets its own appearance package and leather trim; blind-spot monitors; power tailgate; remote start; and 20-inch wheels. Options include 22-inch wheels; load-leveling rear suspension; sunroof; power running boards; and second-row bucket seats. If you have a generous budget, the King Ranch remains a favorite--it gets its own marvelous untreated leather interior that looks and feels and even smells like a baseball mitt, and requires upkeep, showing the warts and scuffs accumulated through the miles. The Expedition Platinum gets just about everything standard except the load-leveling rear suspension, Brunello leather interior, second-row bucket seats, and a DVD entertainment system, which all remain options. The Platinum model is the only one that offers adaptive shocks--part of a $2,180 package that also includes 22-inch polished aluminum wheels. Gas mileage has improved a little with the twin-turbo V-6, but it's still low. SUVs as large as the Expedition don't make a big pretense about fuel economy--but Ford has made some efforts to improve the numbers generated by the big ute for the EPA. Last year, the Expedition was rated as low as 13 miles per gallon city, 18 miles per gallon highway, when outfitted with its V-8 engine and four-wheel drive. This year, the Expedition gets a twin-turbo V-6 standard, and the numbers have moved higher. 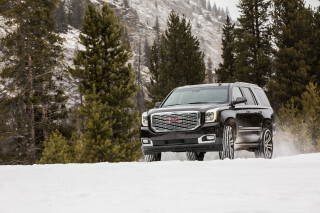 Now, rear-wheel-drive Expeditions are rated at 16/22 mpg, or 18 mpg combined. With four-wheel drive, they're 15/20 mpg or 17 mpg. On long-wheelbase models, the numbers are still better than last year--at 15/21 mpg or 17 mpg combined for rear-wheel drive, and 14/20 mpg or 16 mpg combined with four-wheel drive. It's always worth considering the use of the vehicle. Keep the Expedition in the garage until it's really needed, and it's considerably greener. If you plan to put all three rows of seating to work most of the time, the Expedition's useful efficiency becomes that much better. We've seen up to 17.8 mpg combined on long interstate runs in a 4x4, standard-length Expedition loaded to the roof with cargo.